Ali Griffen and Ella Darcy accept the cup and medals on behalf of the Division 2 Champions, Clanns U13 girls team – Olivia Mohan, Lauren O Brien, Jessica Dolly, Holly Lewis, Sophie Carr, Lauren Thirroueiz, Ella Bruton, Emear O Neill, Maura Montgomery, Lucy Crowe, Chelsea Brophy, Katie Dunne, Laoise O’ Shea and Meganne Dunn, Ella Darcy, Timea Kovac, Ali Griffen, Lauren Darcy, Aisling Madill, Lucy Mulcahy, Ella Whelan, Zara Lynch, Grace Conn. The last fixture of the season for our U16 footballers was a momentous occasion as it was their last game at juvenile level for a group of players who have been playing together since they were U8s. While a win would have been nice, it was not to be as the visiting Clontarf side proved too strong for our lads. Still, this was always going to be more about the occasion than the result. After all, this is the team that surpassed all expectations to win the Football Féile in 2014 by defeating a strongly fancied Kilmacud Crokes side in the final. More importantly, this is a bunch of lads who have, through playing together, developed friendships that will likely see them through many years to come; and will hopefully see them continuing to play at minor and senior level for the club. The seeds of other future successes were sewn by our U14 footballers, who brought their league season to a good conclusion by winning promotion to Division Four. They finished second in the league table behind O’Tooles on the same total number of points but a lower scoring difference. For the record, they would have won the league outright had they managed to defeat St Peter’s in their final game. However, short of ten players from their regular squad, Clanns were always likely to struggle to take the game to their opponents and this proved to be the case. The fact that they had comprehensively beaten the same opposition some two weeks earlier was a clear indication of what otherwise might have been. Still, promotion to the higher division next season is a welcome and just reward. Pictured: Minor hurlers who contested the championship final: Dean Fitzpatrick, David McGauran, Karl Morgan, David Kennedy, Caoimhin McCarthy, Cian O’Regan, Sean Barry, Odhrán Lowry, Eoghan McKay, Eoin Barron, Robbie Kennedy, Conor Farrelly, Conor Ennis, Patrick Duffy, Joe Jordan, Conor Rimmer, Des Duggan, Colm O’Briain, Darragh Levins, Seamus McCann, Conor Barnes, Tomás O’Connell, Sam Callan, Aaron Linanne, Niall Madill, Ted Walsh. 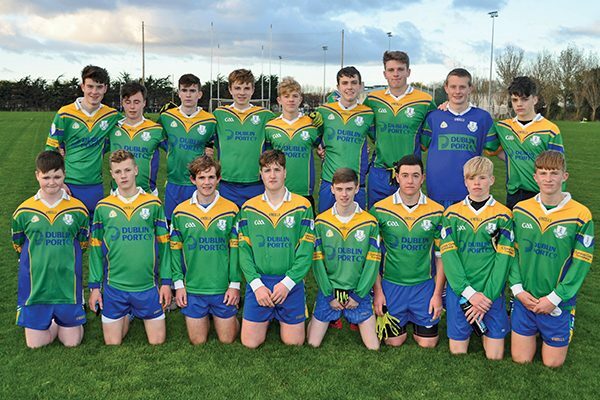 To generally hold their own in Division 2 in their first year at minor level was a major achievement in itself for our hurlers who play under the colours of Isles of the Sea (Clanna Gael Fontenoy and Scoil Uí Chonaill combined). But they went a major step further in reaching the final of the C Championship only to come up short by two points to a tough Erins Isle side. They raced into a commanding lead through well-taken goals from Eoin Barron and Conor Barnes, together with a point from Darragh Levins, before the opposition had registered their first score. That came from a penalty shot which Dean Fitzpatrick in goal did very well to save initially, only to see an inrushing forward hit the net from the rebound. The half-time score of 2-3 to 1-3 in favour of our lads showed this match to be an even contest. As the teams continued to trade scores, that lead was maintained well into the second half with further points from Darragh Levins, Robbie Kennedy and David Kennedy and a fine opportunist goal from Ted Walsh. But Erins Isle managed to finish the stronger to clinch victory with a final score line of 2-12 to 3-7. 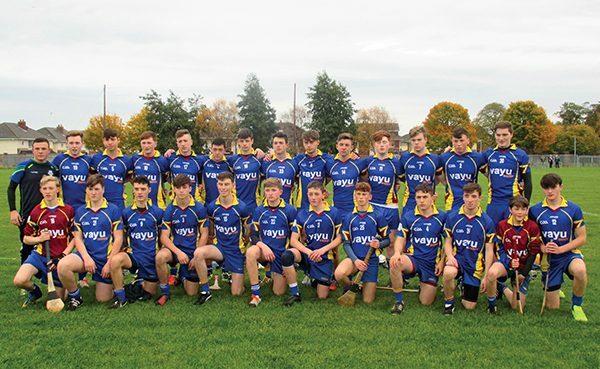 Clanns U16 footballers: Shane Boyne, Rory O’Kennedy, Theo Scolard, Evan Caulfield, Harry Murless, Conor Power, Kevin McGrath, Donal Byrne, Cillian McCarthy, Shane Gallagher, Rohan van den Akker, Matthew O’Rourke, Conor Rimmer, Scott Collopy, Cian O’Regan, Conor Pugh, Conor Hennessy. Photos courtesy of Roger McGrath. A disappointing result but a great achievement nonetheless; and, apart from the players themselves, great credit is due to Ciarán Murphy and Tommy Naughton on the coaching front and to Colm and Ramona Kennedy for their management and motivation. There are plenty of grounds for optimism. 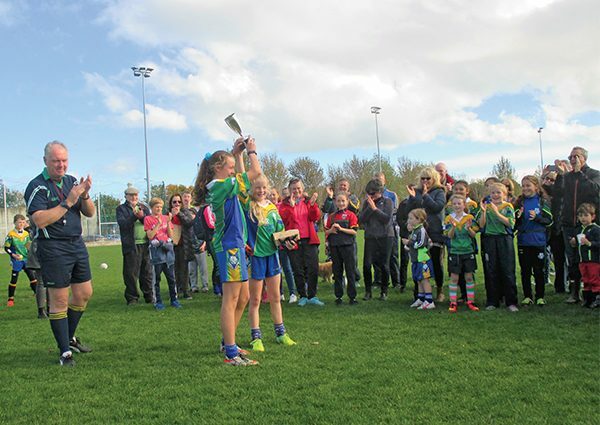 While our Intermediate Ladies football team blazed a trail of glory to win the Dublin championship and make it all the way to a Leinster final, a number of the younger age groups have also enjoyed great success. It’s been a season to remember for our U13 girls. First up, our Division 5 team were crowned league winners. They were unbeaten throughout and were full value for their achievement. They also participated in the Division 4 Féile and had great success with a fantastic win over Naomh Olafs in the final. More was to follow, with our Division 2 side winning the League Championship. They won all of their matches in the group stages and had a comfortable win over St Brigids in the semi-final. Playing the final against Castleknock at home in front of an enthusiastic crowd, the girls saved their best performance for last. Clanns never looked like losing this game and ran out deserving winners on a score line of 6-5 to 2-4. Scorers on the day were Lauren Darcy with 3-3, Lucy Crowe with 2-0, Katie Dunne 1-0, Zara Lynch and Lauren O’Brien 0-1 each. Not to be outdone, our U15 girls’ football team claimed the Division 3 Shield in a hard-fought match against St Pats of Donabate that had everything – including a nail-biting finish. Despite enjoying more of the possession and playing some very good football, Clanns somehow found themselves facing a seven-point deficit at half-time. Fortunately, ball possession was better translated into scores during the second half to bring the teams level at one point. However, a purple patch for St Pats suddenly saw them go eight points up with five minutes plus injury time left. This is when the Clanns girls showed real character. They battled with determination to work themselves back into contention. Deep into injury time they were still a point down when awarded a 21-yard free which resulted in the ball sailing over the keeper’s head into the back of the net. Cue the final whistle and wild celebrations!